The browser client uses AngularJS 1.2. It also uses a variety of dependencies (e.g. angular-bootstrap, etc.) that depend on the version of AngularJS in use. To better prepare for the pending release of Angular 2.0, and to avoid the pitfalls of falling too far behind, we should update the browser client code and dependencies to use the latest stable version of Angular (1.5). Opening this now to kick things off. Will follow up with more details on what steps I expect will be needed and hopefully some initial code. As a heads up, once the ball is rolling, I believe we'll need a good bit of community assistance with testing the existing code to ensure that no stones are left unturned. Updated the target version from Ang 1.4 to 1.5, which was recently released. Code is partially functional, but some UI's / components still need work. More to follow. The update is causing problems with our local eg-date-input directive. After some futzing I'm unable to get it working. As a solution, I would like to propose that we start using angular-bootstrap's native calendar widget, which works much better in the newer code. https://angular-ui.github.io/bootstrap/ -- Search down for "Datepicker". Testing will reveal all, but on the face of it, I'm +1 for trying the angular-bootstrap date picker (and time picker, presumably). Thanks to both of you for the input. Mike, to answer your question, yes, my plan is replace the internals of eg-date-input to use the date (and optionally) time picker internally. I pushed a commit to the tip of the working branch as a first stab at this. It required some mild HTML refactoring in some cases to correct layout changes. I also modified any <input eg-date-input..> elements to be <eg-date-input..> elements, to better emphasize that it's not a single input, but a full blown widget in its own right. Testing looks good so far. Otherwise, the only other big thing remaining I'm aware of for the 1.5 migration is to repair the dropdown buttons. They're not opening for some reason. This happened once before and just required a change an attribute change. 1. Elements that have class="dropdown" need to also have a value-less "uib-dropdown" attribute. 2. Elements that have class="dropdown-menu", replace with a value-less "uib-dropdown-menu" attribute. 3. Elements that have class="dropdown-toggle" and/or data-toggle="dropdown", replace either/both with a value-less "uib-dropdown-toggle" attribute. Will work on others as I can. Patches appreciated! A quick note on running the new code: the simplest way to update your local angular + dependencies is to delete the bower components and rebuild. Note that 'grunt all' will fail. Something is dying within the unit tests. Pending investigation. Bill, I was looking over this and noticed a minor thinko ... seems small enough that a branch would be overkill. That <ng-date-input> opening tag is a typo, I think. Thanks, Mike. I have rebased the branch to master to resolve conflicts with the recently merged patron editor code. Pushed another fix to address the issue Mike raised. Plus one more fix to repair org unit dropdown widget. I've also pushed some drop-down menu repairs to the collab branch; I intentionally didn't touch cat templates yet pending merge of the final sprint2 branch. 2. Remove or rename the "bower_components" and "node_modules" directories. You may not have to remove the directories, but if you don't, it will ask questions about which versions you want to install. With the dependency directories gone, it handles all of that for you by rebuilding everything. Signed off on Galen's final commits and merged the lot into master. Thanks, Galen! Reopening this bug per IRC discussions (http://irc.evergreen-ils.org/evergreen/2016-05-04). As discovered at the Evergreen conference, we found that attempts to compile the web staff client with these patches for Angular 1.5 merged to master failed for Debian Jessie and Ubuntu 14.04 and 16.04. In short, the hotkeys plugin went through some renaming, similar to the ui-bootstrap stuff. Build works fine on Ubuntu 14.04, but on testing with Ubuntu 16.04, it complains about phantomjs-launcher unmet dependency. npm WARN karma-phantomjs-launcher@1.0.0 requires a peer of phantomjs-prebuilt@>=1.9 but none was installed. If I install phantomjs-prebuilt manually with "npm install phantomjs-prebuilt", then re-run the steps "npm install", "grunt all" then the grunt all is happy and it appears to build successfully. After applying the above fix branch, it now builds on Ubuntu 14.04. 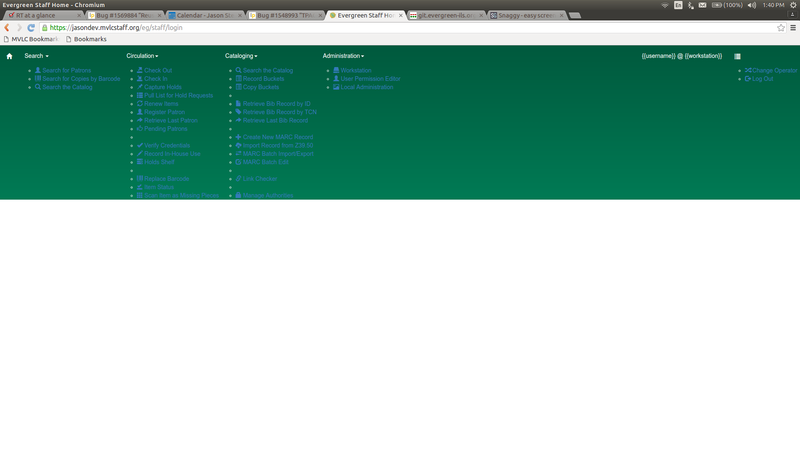 However, just going to the login page results in the attached screen shot. I have not tested the above branch on 14.04. It should work in theory, but needs confirmation. Force pushed a functional (*gasp*) solution to the hotkeys issue back to same branch. Solution was simpler than I originally though. Also force pushed the same phantomjs fix, but including the modified hotkeys fix for testing them together. Tested both commits with Ubuntu 14.04 and 16.04. Web staff compiled without error and was usable for basic function testing (i.e. logging in, clicking through menus). Tested the above commits, via Ben's signoff branch, and they fix the issues on Ubuntu 14.04 and 16.04 for me. I assume they resolve the issues on Debian, also. Signed off and pushed to master for great justice! With the release of angular 1.5.6, the deps fail to locate this version cause we are looking specifically for angular 1.5.5 in the bower.json file. Patch at the top of this working branch changes it to look for ~1.5.5 (aka, minimally angular 1.5.5, but any higher version of 1.5.x will do). Tested and pushed Ben's 155andup patch. Looks good. Thanks, Ben.